I’ve been in the tax business for over 25 years, but when I go to the mailbox and find a letter from the IRS, I still get a tinge of fear. I’m sure they have a similar effect on you. And unless you are among the lucky few, sooner or later you’ll get one. What should you do when you receive one? The first thing you should do is read it. 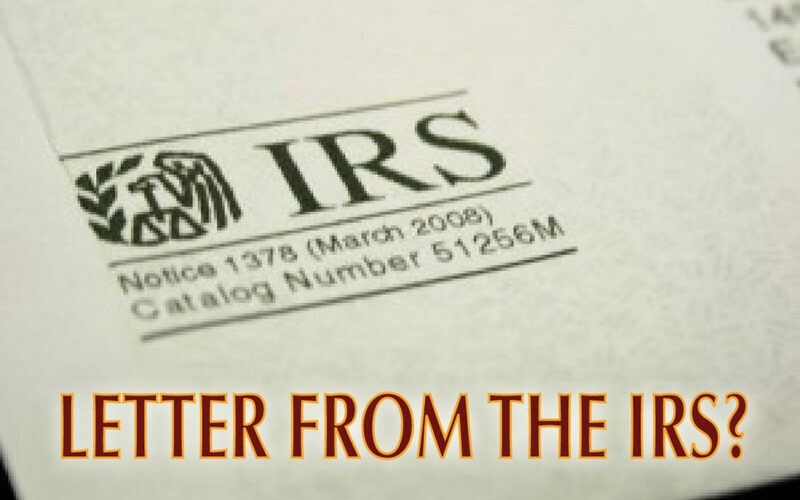 That may sound funny, but most phone calls I get from clients when they receive this letter goes something like this: “I got a letter from the IRS, what do I do?? ?”; “What does it say?”; “I have no idea!”. Tax topics seem foreign to most people – but the letters usually have some semblance of English in them and most folks can understand the basic gist once they make an effort. The next thing is to take some action. Again, it may seem common sense to you, but many people will ignore it. Most letters do require some action on your part and have a deadline to do so. If you don’t respond, the IRS will respond for you and you can bet it won’t be in your best interest. There are different types of letters you may receive. The most common letter is known as the “CP2000.” You receive tax forms from various payers and payees telling you what they have reported to the IRS. The IRS has a program they refer to as the CP2000 program that matches all of these numbers. With all the stuff most of us have in our financial lives, it’s easy to miss one of those little forms, or to have something misreported. Most of the time, the IRS is right on these issues and the only thing left for us to do is to verify it, and to pay the bill. Another common letter that goes out frequently simply asks for a tax return. Some folks are lucky enough to have arrived at a point in their lives where they simply no longer have to file. Or perhaps you just forgot, or procrastinated. Whatever the situation is, you do need to respond to this letter with either a filed tax return or an explanation of why one is not required. The last notice I’ll discuss is not nearly as common but far more dreaded – the audit notice. They call it an examination letter. It will tell you exactly what they will be looking at and when they plan to perform the “examination”. For most people, there is usually a large sum of money at stake at this point and hiring somebody is advisable. Most tax professionals will charge a minimal fee to talk to you about what to expect and to provide some pointers to help you prepare. Certified Public Accountants and Enrolled Agents can even go to the audit for you, if you prefer. The best way to deal with correspondence with the IRS is simply to not be contacted in the first place. Whether you prepare your tax return yourself or hire somebody to prepare it for you, always review it for completeness and accuracy. Remember, even if somebody produced the forms, you’re still responsible for what is on them. If you are unsure, many tax preparation services will review the return for free. Audits may happen, even if you do everything right. The best defense against them is proper record keeping and documentation. An audit can be very quick and easy if the tax payer is organized and complete in their record keeping duties. Whatever the situation is, you don’t have to face it alone. There are many qualified tax professionals available to help you resolve whatever problems that may arise. The best way to find somebody is usually to ask friends and family who they use and if they’re happy with them. Another way is to simply use the phone book or internet to find a firm that is close to you and schedule a consultation. You can do that with as many professionals as you need to until you find somebody you’re comfortable with.